Opera on Tuesday revealed it has submitted its mobile browser, which relies on server-side compression to offer faster mobile Web browsing, to the iPhone App Store, where it now awaits Apple's review. "The Opera Mini for iPhone sneak peek during MWC told us that we have something special," Jon von Tetzchner, co-founder of Opera Software, said in a press release. "Opera has put every effort into creating a customized, stylized, feature-rich and highly responsive browser that masterfully combines iPhone capabilities with Operas renowned Web experience, and the result is a high performing browser for the iPhone." The company has advertised that its server-side rendering allows compression of data by up to 90 percent. Nick Bilton of The New York Times used the latest version of Opera Mini for iPhone, and reported Tuesday that the browser "loaded pages extremely quickly." He also said the browser offers features unavailable in Apple's own Mobile Safari, including the ability to search the content of a Web page. But Opera Mobile also lacks one defining feature of the iPhone: pinch-to-zoom capabilities. The feature could reportedly be added in a future release of the software —if Apple allows. Last month, Opera began touting the speed of its mobile browser, which uses a special form of compression to render Web pages more quickly. Before its official unveiling, talk of Opera Mini for iPhone occurred soon after the App Store opened in 2008. Until now, Apple has rejected any browsers that are not based on the WebKit engine built into the iPhone OS. The Cupertino, Calif., company has not indicated that it has changed its policies, suggesting that Apple could reject Opera's submission. Officials with Opera have said they believe there is no reason for Apple to reject the Opera Mini browser from the App Store. 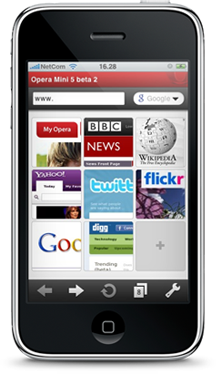 Opera's mobile browser is not based on the WebKit open source project. Opera's iPhone browser reportedly achieves speeds up to six times faster than Apple's Safari when running over 3G. The alleged superior speeds are achieved through compression technology used by the company that allows less data transfer by using the company's servers.